In Greek mythology, Iolaos was a nephew of Heracles. Iolaos helped his uncle in some of the Twelve Labours of Heracles, especially in defeating the Hydra, a nine-headed beast (one of them beeing immortal). 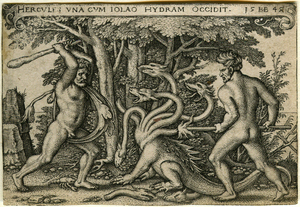 First, Heracles tried to kill Hydra by cutting off her heads, but for each removed head, two new heads grew back. So, Iolaos scorched the stumps after decapitation, thus preventing Hydra from regeneration. Here, Iolaos is a small toolkit intended to facilitate the access to the SPEs of the Cell BE.